Piers were originally built for the purpose of getting people and cargo from the boat to the shore without getting their feet wet, before they developed into pleasure devices. 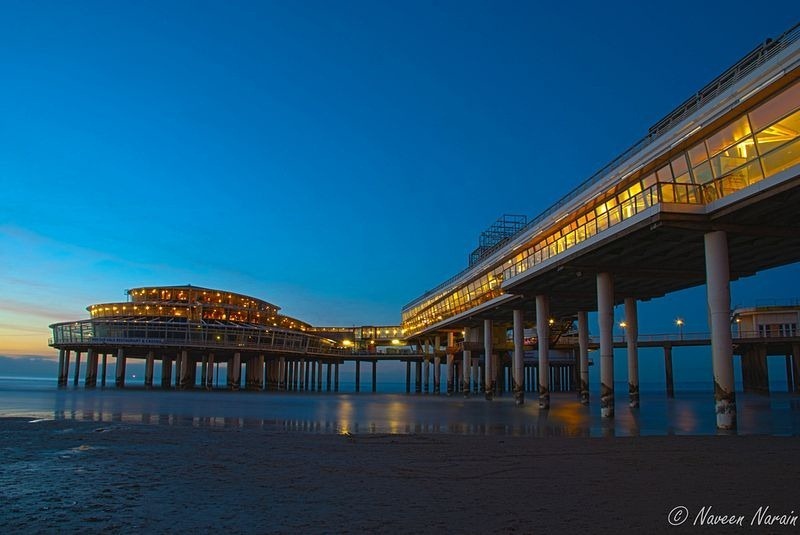 Some of the first pleasure piers were built in Britain during the early 19th century. At that time, the railways were expanding and tourists from all over the country were flocking to coastal resorts. 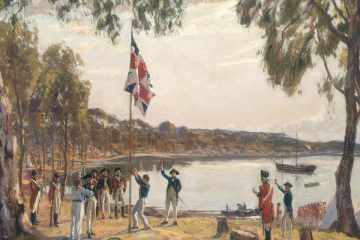 But at many resorts the sea was not visible from land when the tide was out, prompting resort owners to build long piers so that holidaymakers could promenade over and alongside the sea at all times. Now fitted with shops, restaurants, carnival rides and dance floors, they have become an integral part of every beach town culture. Since the early Victorian period, piers have been popular attraction in Britain as well as in North America. They are places where people gather, have fun or a leisurely walk above the ocean waters. Many piers are now historic treasures featuring some of the area’s oldest architecture and vestiges of the past. 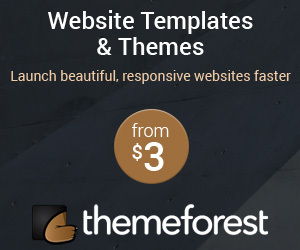 Modern ones feature unusual architecture and artistic design. Here are some of the most noteworthy and beautiful piers around the world. 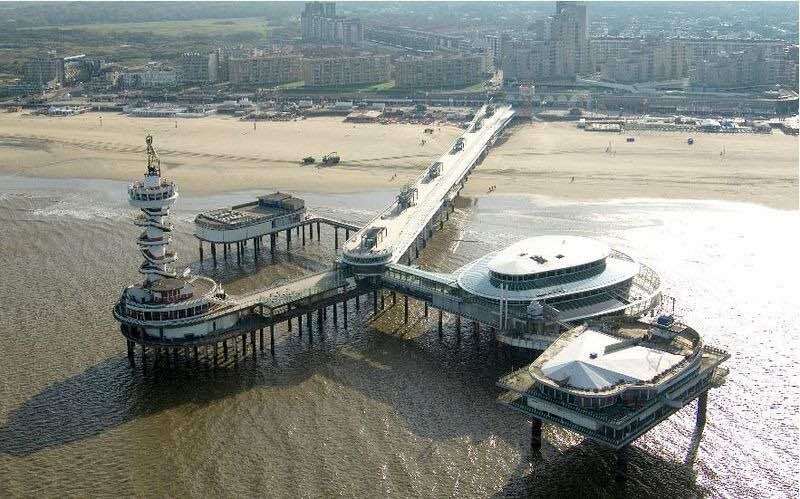 The Scheveningen Pier, in the Dutch town of Scheveningen near The Hague, has an unusual design. The pier has two levels, the lower deck being a closed-in section while the upper one is open to the elements. Its farthest end branches out into four terminal sections called “islands” with shops, restaurants, a food boulevard, a casino, banquet and meeting rooms, and 60 meter high tower with viewing platform and facilities for bungee jumping. The 380-meter pier was built in 1959. 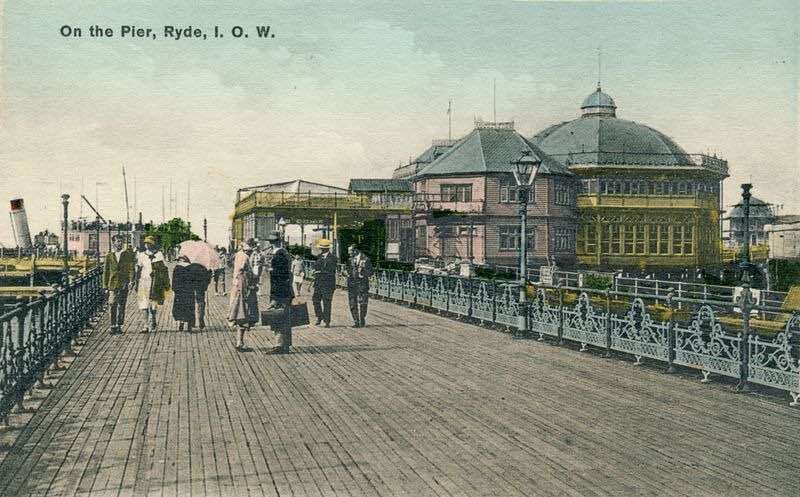 The pier in the town of Ryde, on the Isle of Wight, off the south coast of England, is the world’s oldest seaside pier. This timber-planked promenade was opened in 1814, and is 681 meters in length. It is possible to drive along the pier, and there is car parking on the large pier head. 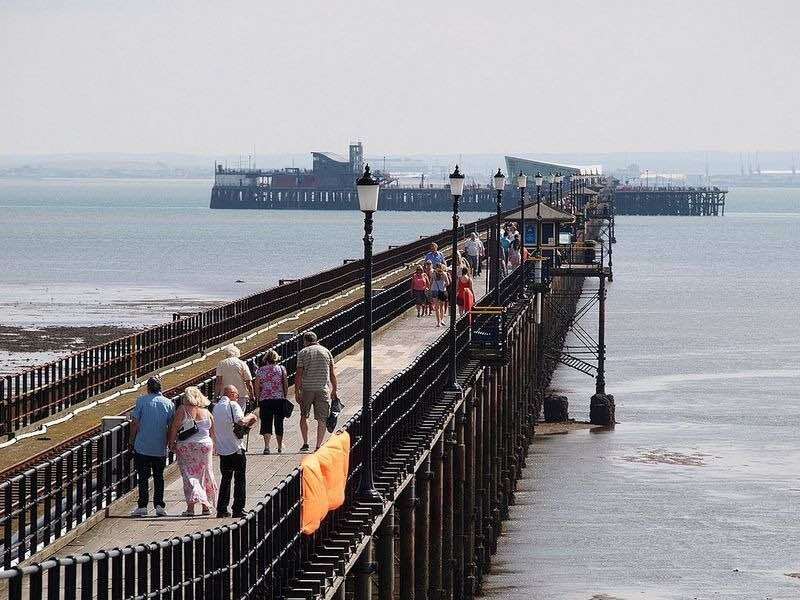 Southend Pier in Southend-on-Sea, a seaside resort town in Essex, England, is the longest pleasure pier in the world with a length of 2.16 km jutting into the Thames Estuary. 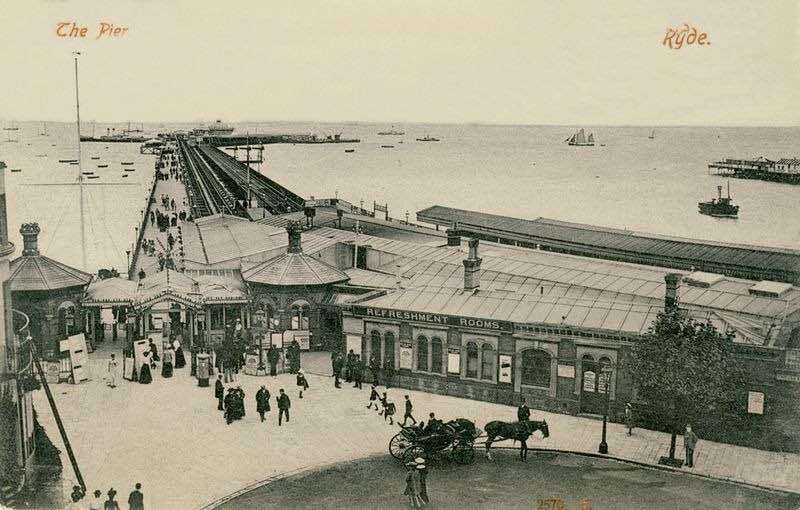 The pier was originally built of wood in 1830, then replaced with a new iron pier in 1889. 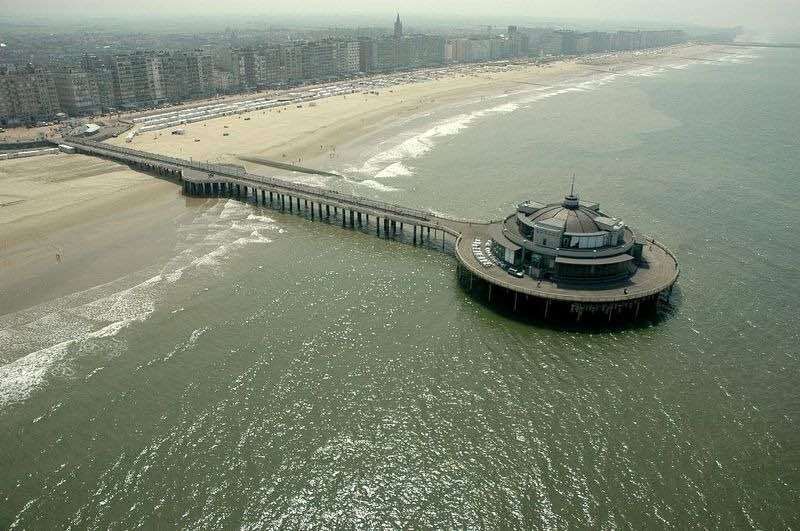 The pier of Blankenberge in the Belgium town of Blankenberge was built in 1933. 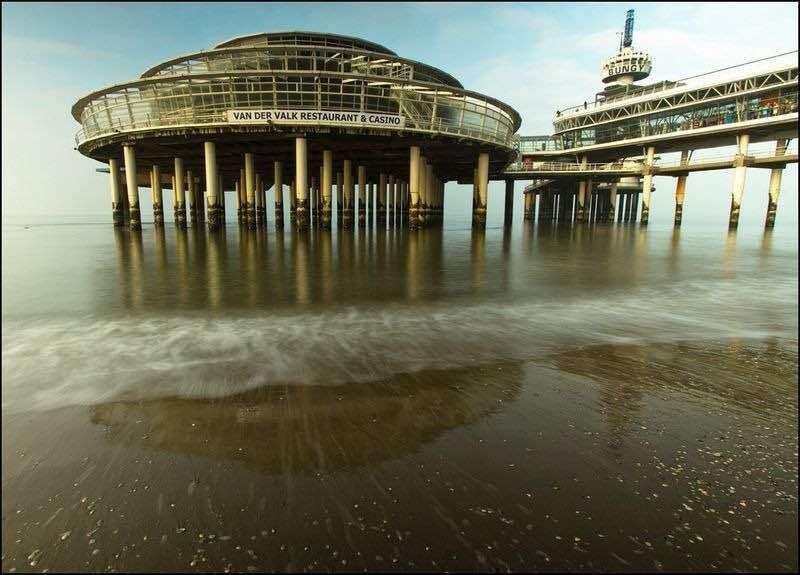 It is made ​​of concrete and sticks 350 meters into the North Sea. 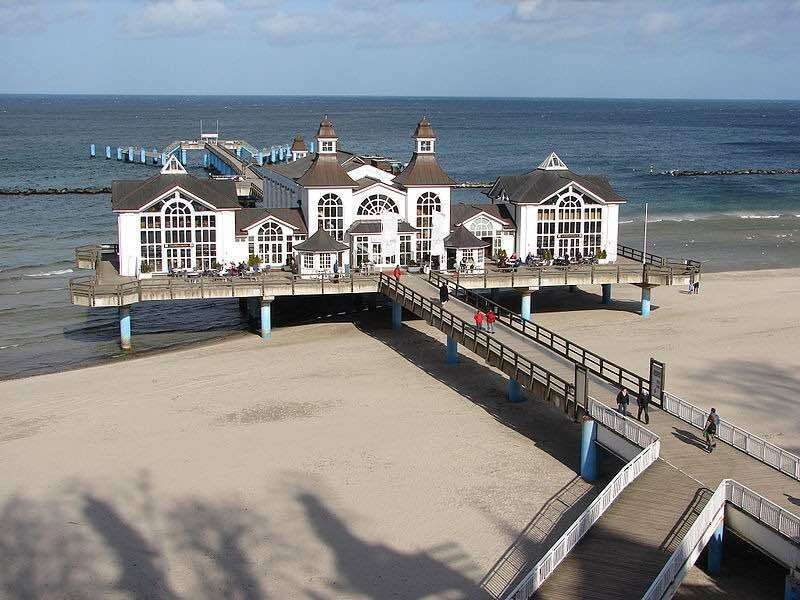 Blankenbergse pier was the first pier on the Atlantic coast of the European continent. Birnbeck Pier on the Bristol Channel in North Somerset, England, is the only pier in Britain that connects to an island — the Birnbeck Island, a 1.2 hectares rocky island just to the west of Worlebury Hill. 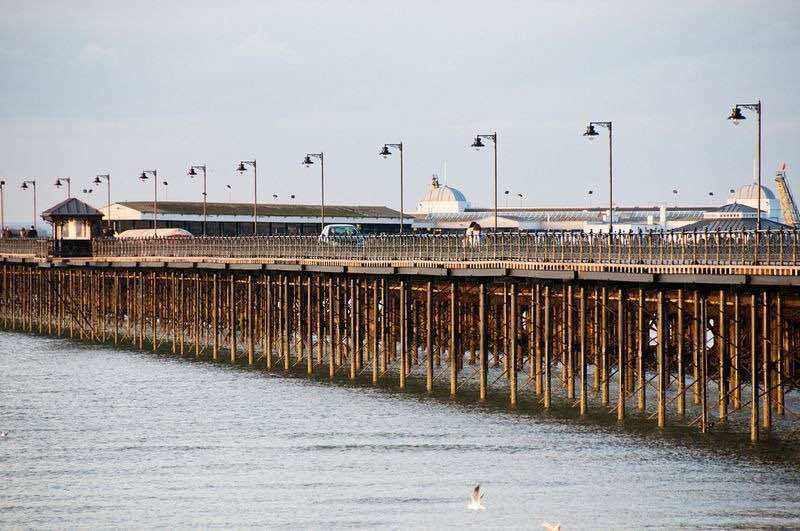 The grade II listed pier was opened in 1867. 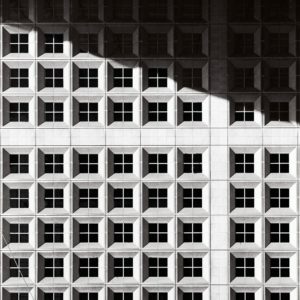 Currently it is closed to the public and is now listed as an endangered building. In fact, part of the pier collapsed as recently as 30 December 2015. 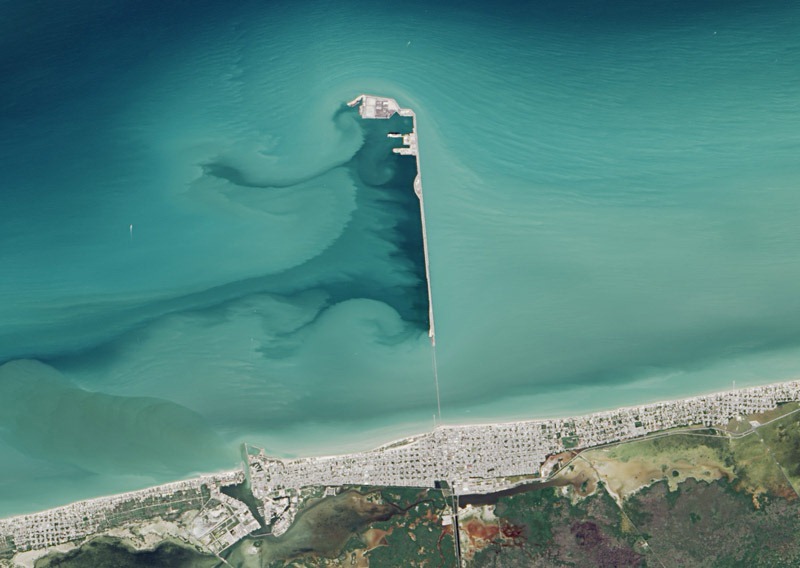 Photograph of the Progreso Pier taken from the International Space Station in 2014. The pier in port city of Progreso, in the Mexican state of Yucatán, is the longest pier in the world. 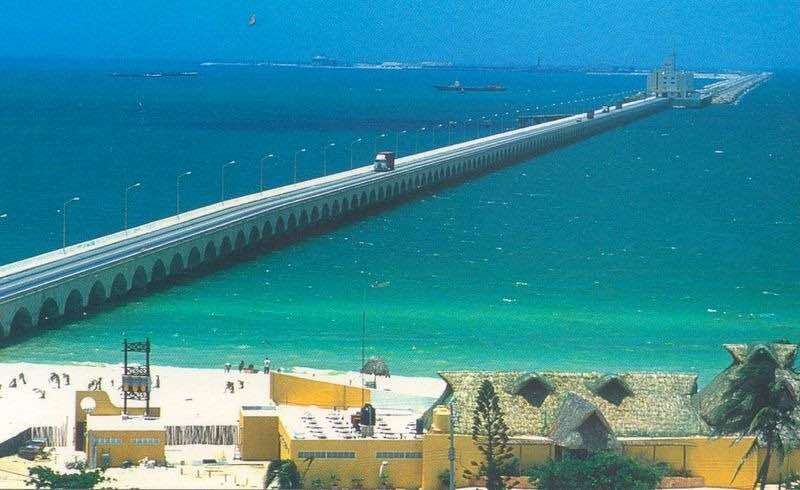 Built with reinforced concrete, the pier juts out into the Gulf of Mexico for a distance of 6.5 km. The unusually long length is necessary to allow large ships to dock since the Yucatan coast is very shallow. 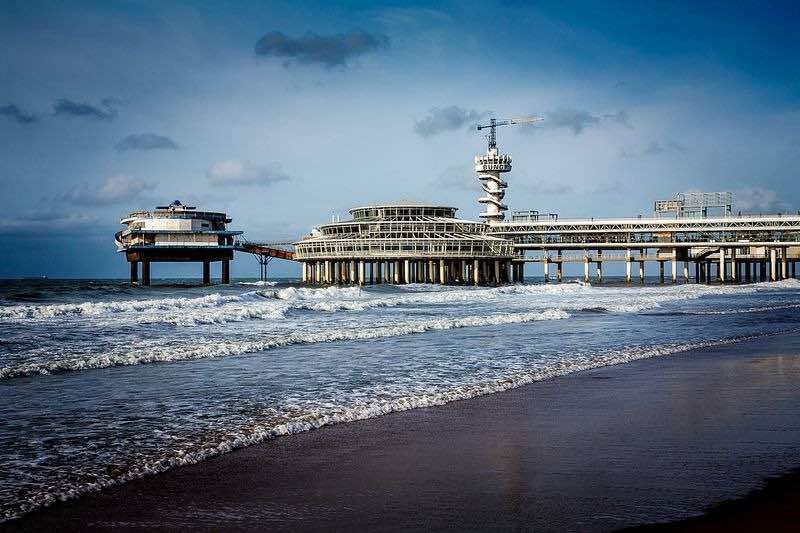 The pier was originally 2,100 meters long and was constructed between 1937 and 1941, replacing a wooden pier that was built in the beginning of the last century. In 1988, an additional 4,000 meters was added to its length increasing the pier’s cargo and container vessels handling capacity. 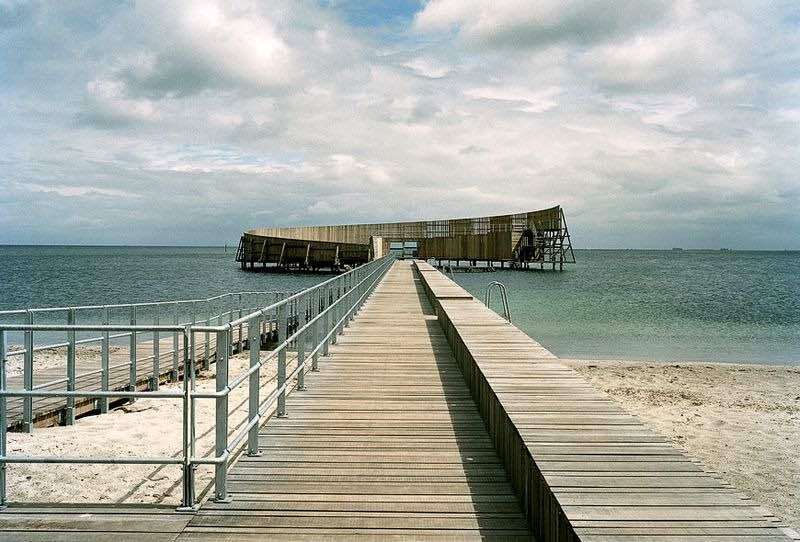 Kastrup Sea Bath is part of the Kastrup Strandpark waterfront park on the east coast of Amager in Copenhagen, Denmark. 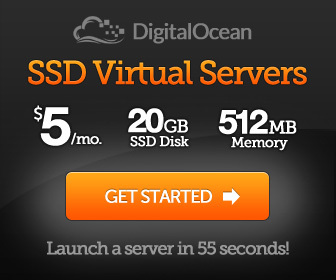 It’s an outdoor swimming poor that sits at the end of a hundred-meter-long wooden pier extending into the Baltic Sea. 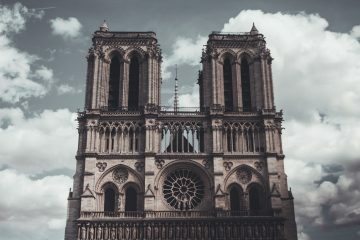 The wooden structure is shaped like a conch, scrolling up and around gradually increasing in height until it culminates in a five-foot high diving platform. The circular wall faces away from the sea and acts as a shelter, protecting swimmers from the wind. 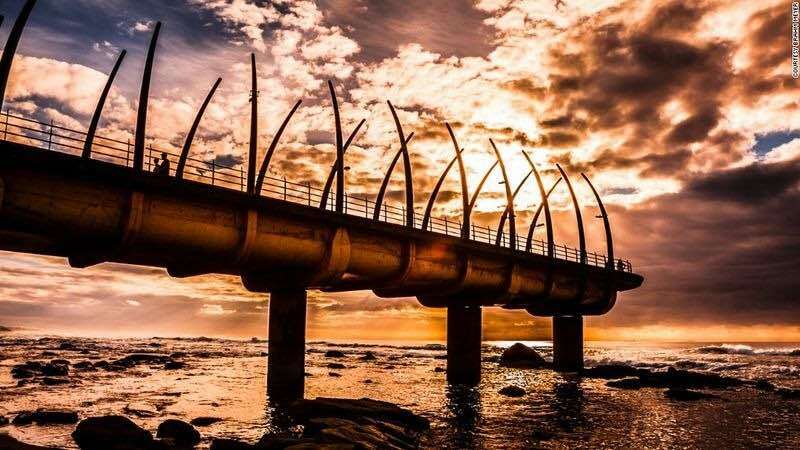 The Umhlanga Pier in the resort town of Umhlanga, north of Durban, South Africa, is a short pier with a design that looks like the ribcage of huge animal. It was called one of the most beautiful pier in the world by CNN. 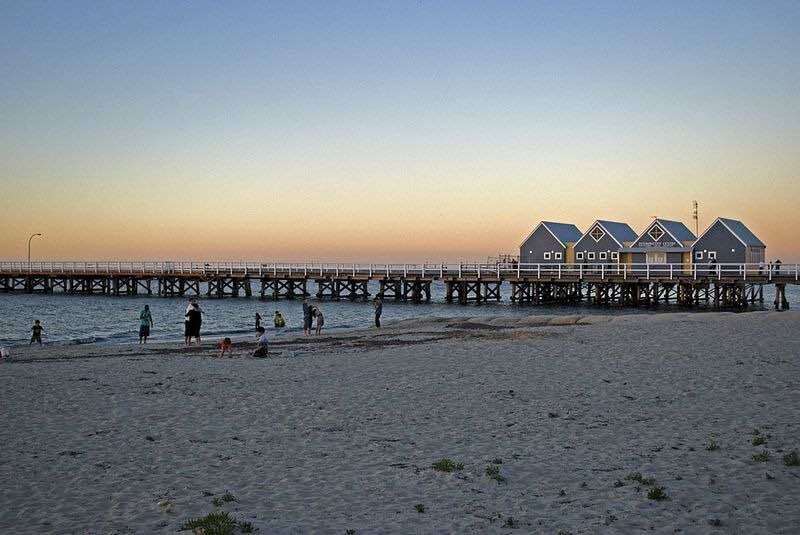 Busselton Jetty is the longest wooden pier in the southern hemisphere, stretching almost 2 km out to sea from the town of Busselton, Western Australia. The jetty was built in 1853 so that cut timber could be transported to ships. The jetty was extended numerous times until the 1960s, ultimately reaching a length of 1841 m. The jetty features a rail line along its length, a relic of the railway line into Busselton from Bunbury. The line now carries tourists along the jetty to an underwater observatory which opened to the public in 2003. 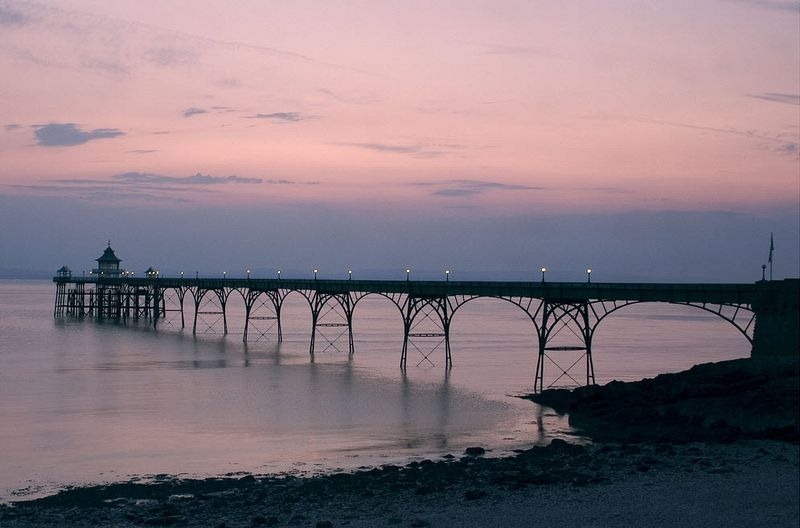 The Clevedon Pier in Somerset, England, was once described as “the most beautiful pier in England” by the English poet Sir John Betjeman. 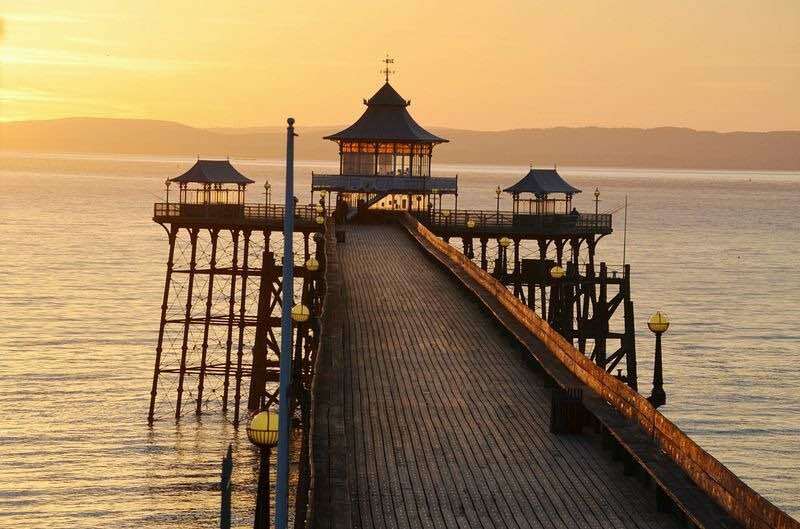 The pier was built during the 1860s to attract tourists and provide a ferry port for rail passengers to South Wales. It still functions as a landing stage for steamers and is a popular attraction for tourists and anglers. 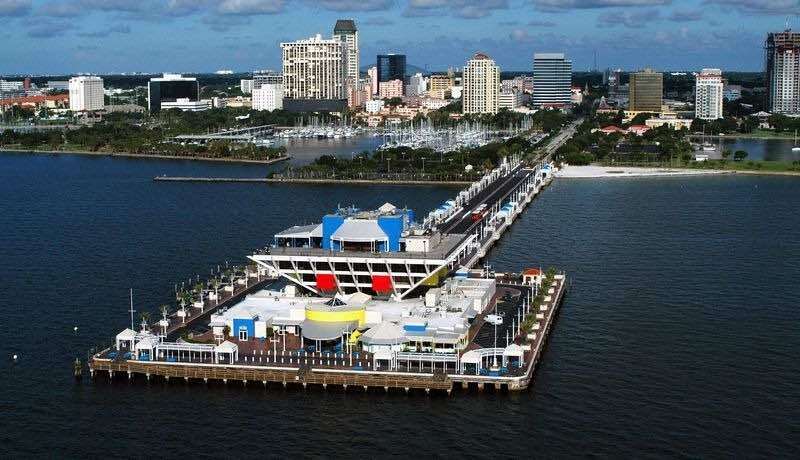 The St. Petersburg Pier was a landmark attraction extending into Tampa Bay from downtown St. Petersburg, Florida. 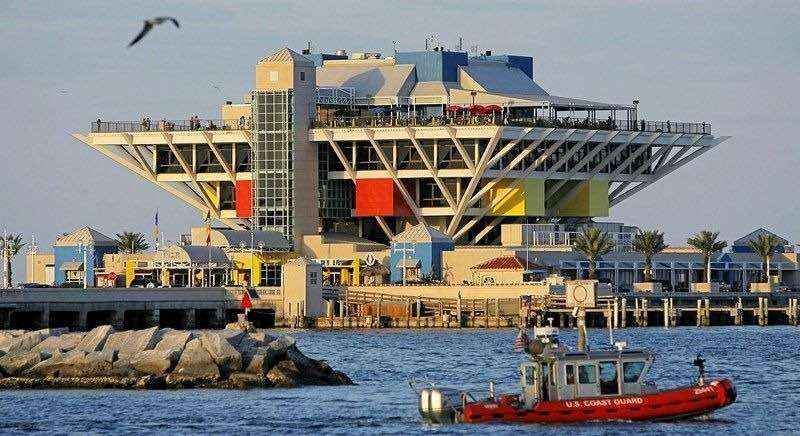 The Pier featured a five-story inverted pyramid-shaped building housing shopping, dining, nightlife, fishing, boat rentals, weekly festivals, and an aquarium. The pier was demolished last year so that a new one could be built. Rotonda a Mare in Senigallia, Italy, was opened in 1933 and soon became a popular attraction. During World War II the Rotunda served as military warehouse, but once the war was over, it once again became the center of social life. 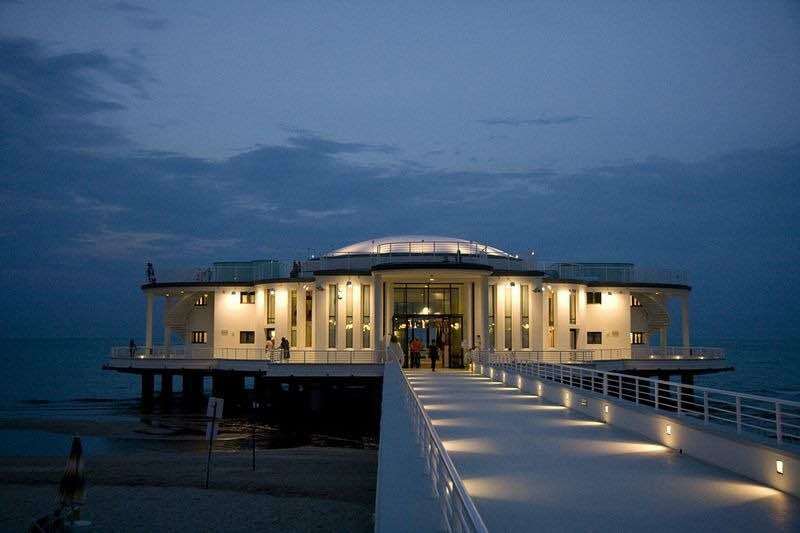 The pier features a round concert hall where many famous Italian artists have performed. 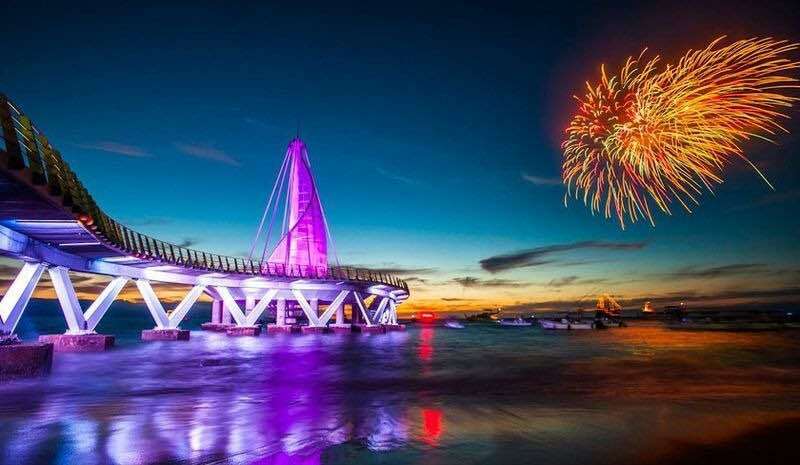 The Los Muertos Pier in Puerto Vallarta, Mexico, is a new pier inaugurated in 2013. 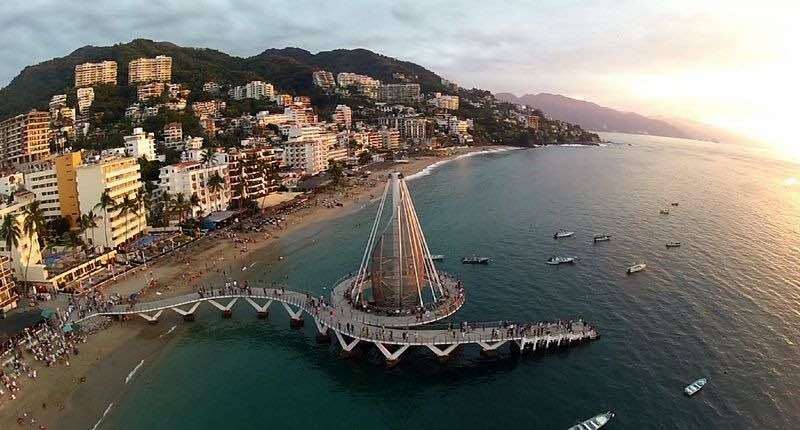 It was designed by architect José de Jesús Torres Vega and features a beautiful spiraling promenade. 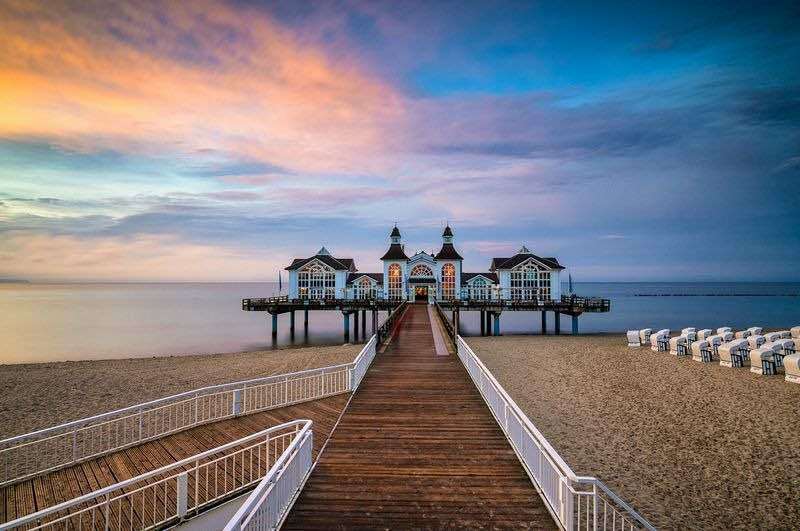 Sellin Pier is in the Baltic seaside resort of Sellin on the German island of Rügen. 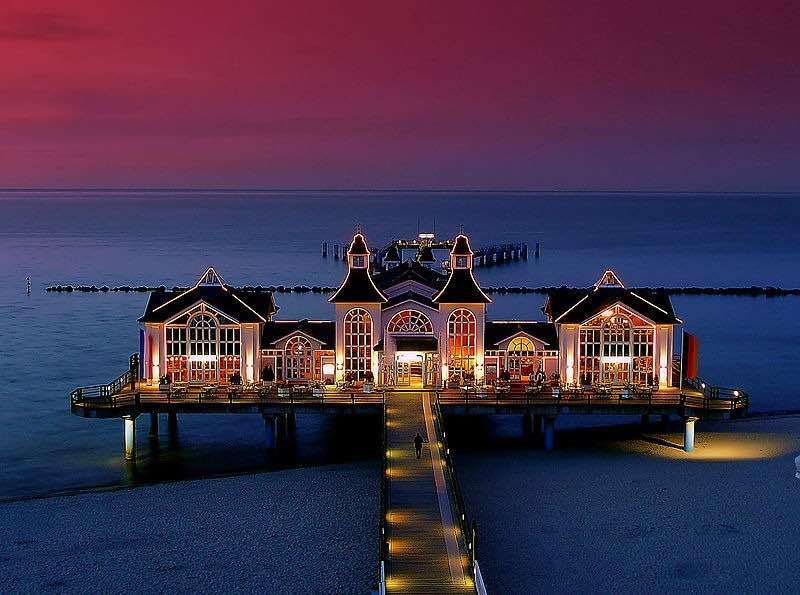 The pier has a restaurant near the beach over the water and has a diving gondola. 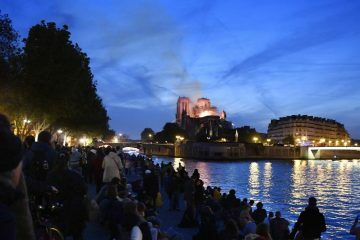 The original pier was 500 meters long and was built in 1925 after the previous pier caught fire. During the 1950s through the 1970s it became the site of a popular dance hall. 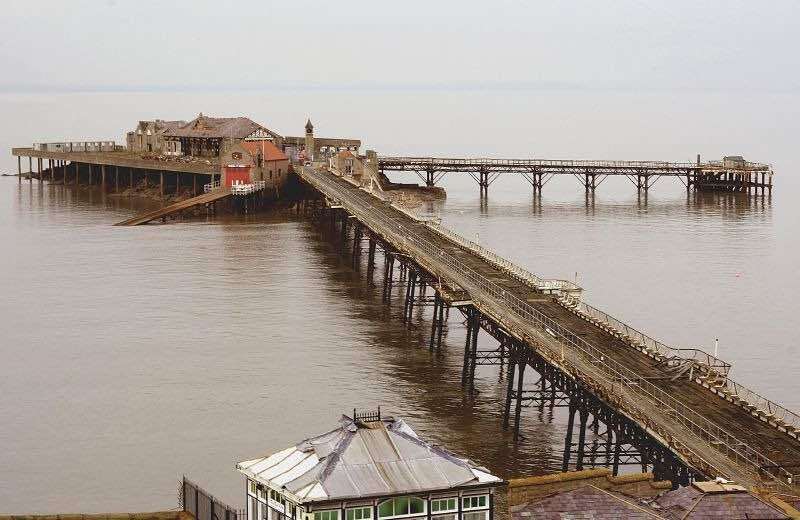 Prolonged neglect however caused the pier to be dilapidated and had to be demolished in 1978. The current pier was rebuilt based on models of the old pier and opened in 1997. The new pier is 394 meters long.